For the past week I have been decorating and then tweaking. Do y'all tweak your decorations or just put them up and leave them alone? I'm bad at not leaving things alone. I shared the French style guest bedroom last week and now it's on to the second room I decorated. I had no idea how I was decorating the house for Christmas this year, but I knew I didn't want to have to move things out to move things in. I wanted to keep things simple this year since I just never know when my mom will end up in the hospital again and I have to go spend time with her. 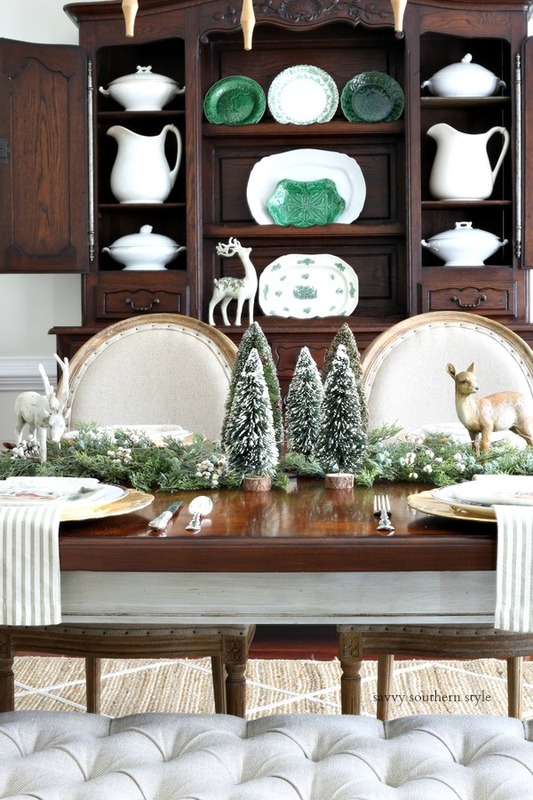 Today we are visiting the French country Christmas dining room. Green and white are the name of the game this year. I had fun putting this room together. I shopped my house to see what I wanted to use as I had no clue before I started. I had actually gone to HomeGoods in hope of finding new dishes, but there just wasn't anything I liked. I pulled these little plates out and then grabbed another plate and charger and started stacking. 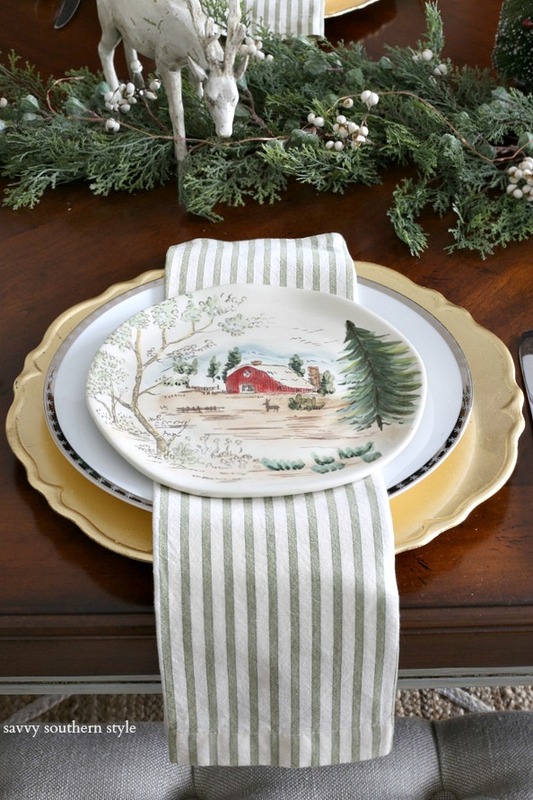 The soft green ticking napkins are old from Pottery Barn. The silver rimmed plate with stars is very old from Target. I took my cue from the scene on the plates to build the centerpiece. I used faux juniper sprigs that look so real and added some dried tallow berries that I ordered on Ebay. The deer were in my stash as I had used them on this Christmas mantel a few years ago. 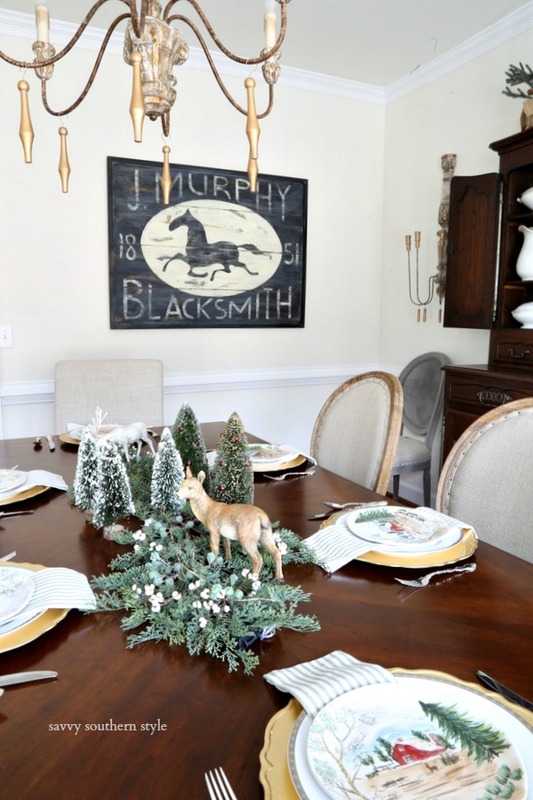 Vintage bottle brush trees and a string of fairly lights finish the centerpiece. Another sparkly deer adorns the hutch and I swapped out the blue and white plates for a mix of green and white. If you follow me on instagram then you saw that I had the two trees, now on top of the hutch, down on the lower part with the deer. I told y'all I have been tweaking things and I decided to try the trees up top and added my willow deer. I normally serve Christmas breakfast in the breakfast room, but we may change things up this year and do it in here. The sun shines in here in the morning so this might be the perfect spot. I added one little Christmas pillow that I received from Ann several years ago. The lights come on at dusk, or when it rains like it was when I took this, and the room looks more festive. The trees on top of the hutch are old from Pottery Barn and the lights run on batteries with a timer. 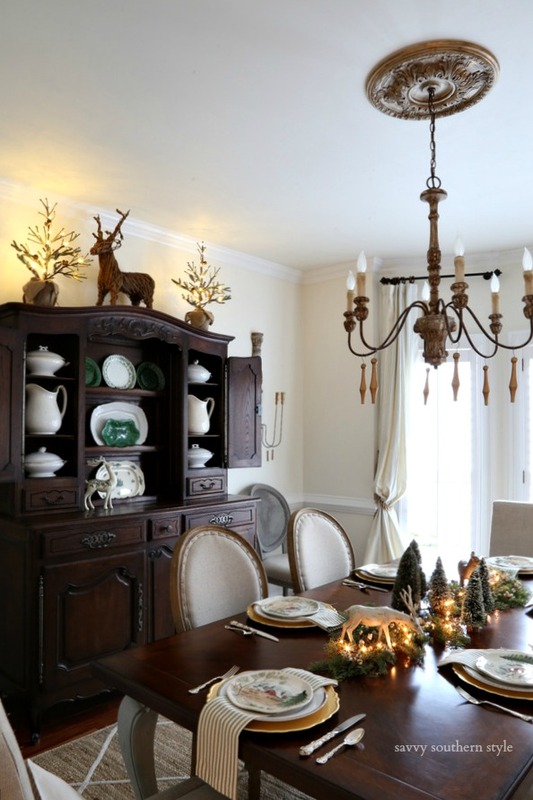 Thanks for visiting the French country Christmas dining room. 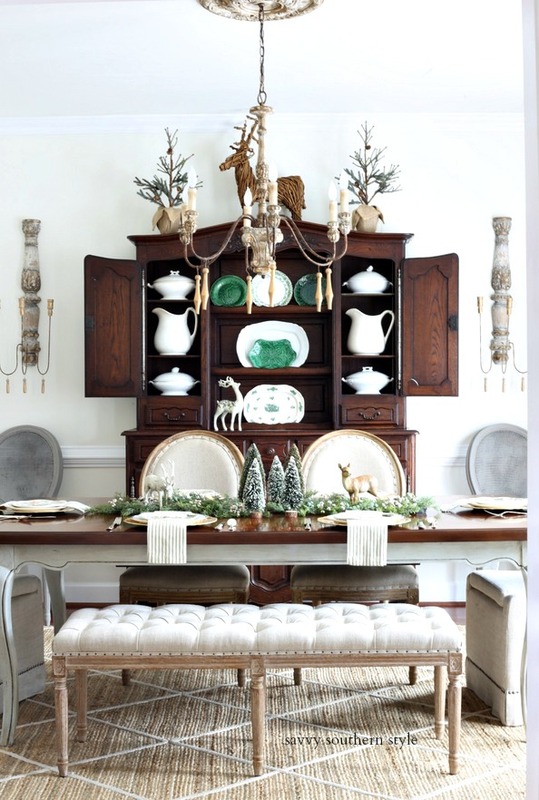 Check out my Christmas dining room last year Here. Kim, I totally adore the green and white this year. Your pretty table centerpiece is stunning with the lights, such a beautiful room. Looks great!! So pretty with the green dishes. I am definitely a tweaker. I put it all up and then go back and tweak. Always fun. 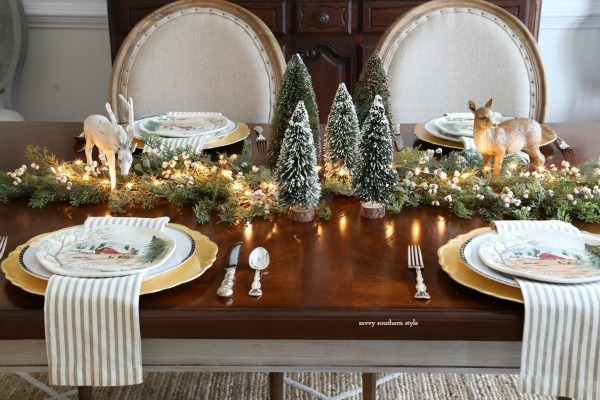 Your deer themed Christmas dining room is beautiful and I love how your dinner plates tie into the rooms theme. Yes, I am a tweaker too..it drives my hubby nuts. I will usually tweak my Christmas décor at least once until I have it just like I want it. 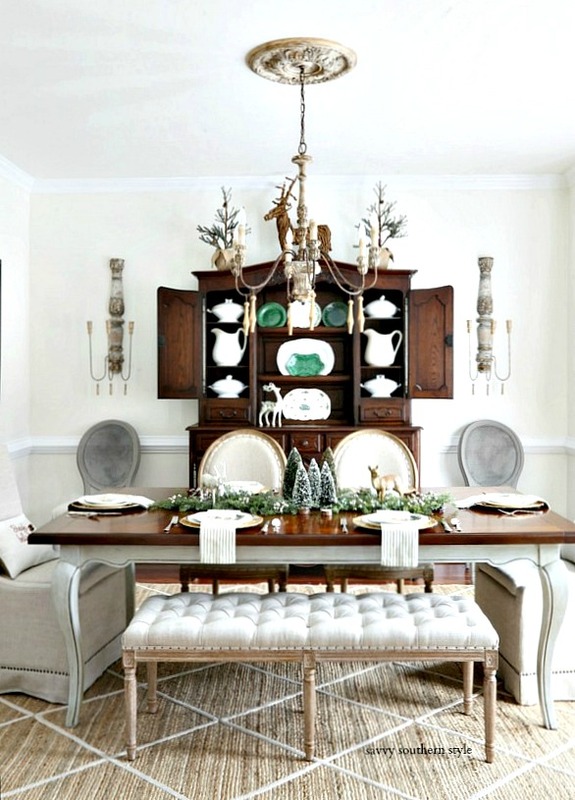 Love the way your dining room looks this year for Christmas. I am still trying to figure out what I want to do on my dining table. I really like the green and white, too! And I love the simplicity of your centerpiece on the table. Just gorgeous! 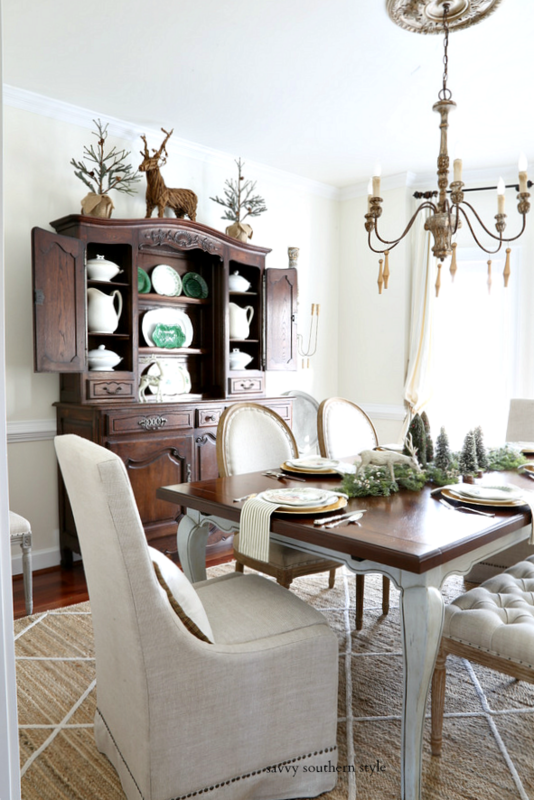 Kim, your dining room is dressed beautifully for the season. The moving out to move in is a lot of work, I love that you keep it simple but very festive. The green and white theme is perfect! Kim, I love this room. You did a beautiful job again. I have to tell you that I belong to several of the suggested blogs but yours is my favorite. Whenever I see yours in my email box I go to it first. I love your style. Thank you so much for sharing all these great ideas with us. You have inspired me greatly. Sometimes I want to ask advice! But I know it is not proper, I just keep watching your posts!! Love, love, love it....and love that you took your cue from the plates and created that most beautiful centerpiece....The green and white with the pops of red are so pleasing to the eye...Love it the natural light and the shimmer of the light at dusk! Love it! 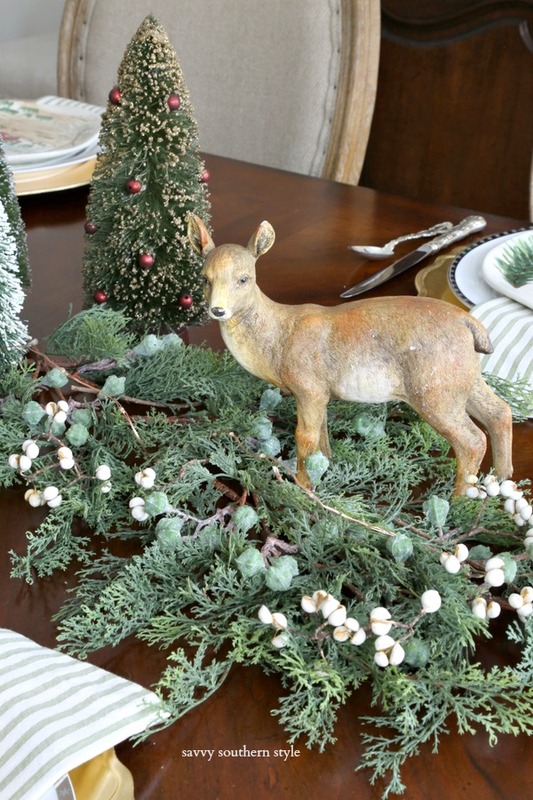 The deer, the pops of green, the simplicity! It's all wonderful, and the perfect spot for Christmas breakfast! Beautiful touches and simple elegance. I, too, love to tweak..it drives my husband crazy, yet he knows when I put something out it will mysteriously move..many times. Habit that is hard to break. Also, I am curious as to what type of camera you use to take photos of your home? Thank you, Lynn. I use a Canon 6D. Your dining room is beautiful but I have to admit I was looking at the gorgeous wood grain of your buffet cabinet! I have a few beautiful old wood pieces and enjoy just running my hand along the grain, opening and closing the drawers and smelling that old woody smell haha. I never noticed how well the dark stain of the cabinet works with your table too. I remember when you bought the piece a while back, but I never really looked closely at it. It's simply gorgeous! Thank you, Katie. I love that old piece and it really has that srong old smell in it and I love, that, too. 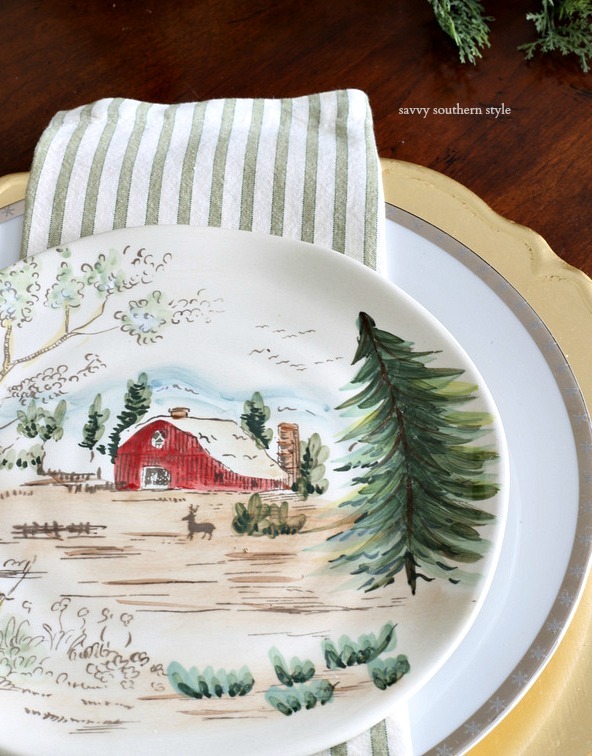 Those red barn plates!! Do you remember where you got them? They remind me of growing up in Wisconsin. I found them at HomeGoods last year.